The Blatz Brewing Company was one of Milwaukee’s industrial brewing giants. Operating from 1851 to 1959, Blatz was an early innovator in bottling and national shipping, the first of the city’s national giants to sell its interests to concerns outside of the city, and the first of these giants to close its plant. The Blatz Brewing Company grew out of John Braun’s City Brewery, one of Milwaukee’s pioneer breweries, first established as the Cedar Brewery in 1846 on the bluffs east of the Milwaukee River, near the corner of Main and Division (now Broadway and Juneau). Braun hired Valentin Blatz shortly after his arrival in 1849. After accumulating enough capital, Blatz opened his own small brewery next door, and, after Braun died in 1851, Blatz purchased his brewery and married his widow. Blatz had trained at large breweries throughout Bavaria before coming to Milwaukee. He quickly industrialized his brewery’s production and turned it into a major leader in the growing local industry by the 1860s. 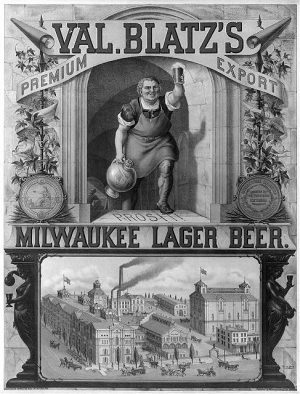 Along with other major Milwaukee brewers, Blatz especially benefited from the nearby Chicago market, opening an agency there in 1865 to facilitate trade with saloons and other retailers, and individual consumers. Fire destroyed a significant portion of the original brewery in 1872. However, this disaster provided Blatz with an opportunity to enlarge and update his facilities with the latest brewing technology. In 1875, Blatz became the first Milwaukee brewery to establish a bottling department to package beer to ship nationally. This bottled beer won top prize at the 1876 Centennial Exposition in Philadelphia. By the 1880s, Blatz increased production to over 100,000 barrels a year and expanded the brewery into a complex that spread across three city blocks. 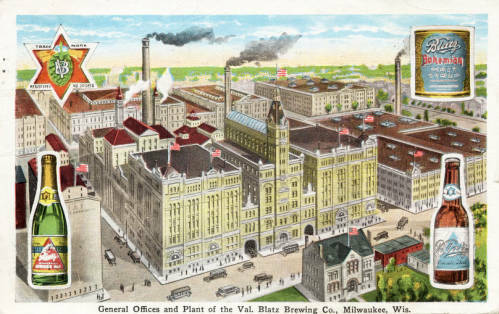 Blatz did not engage in the tied-house system to the extent that rivals Schlitz and Pabst did, though the brewery acquired some prominent Milwaukee real estate by the 1890s, including the Blatz Pleasant Valley Park beer garden on the Milwaukee River and the Blatz Hotel, located on the southwest corner of East Water and Oneida Streets (present Water and Wells). Shortly after the brewery incorporated in 1889, a group of British investors attempted to buy out and merge Blatz with Pabst and Schlitz for $16,500,000. That effort failed, but Blatz sold to the British syndicate, United States Brewing Company in 1891. Valentin Blatz remained the company’s president until his death in 1894, succeeded by his son Albert. As Prohibition impaired the profitability of the American brewing industry, United States Brewing sold Blatz to Edward Landsberg in 1920. Landsberg kept the company afloat through the dry era by producing malt syrup, sodas, and near beer until beer production returned in 1933. The New York-based liquor company Schenley Industries purchased Blatz in 1943, boosting the brewery to ninth largest in the United States by 1947. Part of this postwar success can be attributed to Blatz’s national marketing campaigns. A series of television advertisements featured a cartoon keg, bottle and can trio singing the praises of “draught brewed Blatz” to new television viewers with the jingle, “I’m from Milwaukee, and I ought to know.” Blatz also sponsored the move of the popular “Amos ‘n’ Andy” radio program to television in 1951. This success did not last, as Blatz was not able to keep up with the national industry expansion, consolidation, and modernization, sinking to eighteenth place nationwide by the late 1950s. Pabst purchased Blatz from Schenley in 1958 as a means to compete more effectively with Anheuser-Busch and Schlitz, shuttering the plant in 1959. A drawn-out federal anti-trust suit challenged this sale in 1959, forcing Pabst to “divest itself” of Blatz ten years later. After receiving bids from the Stroh Brewing Company of Detroit, the Associated Brewing Company of Detroit, and the local United Black Enterprises, Pabst sold Blatz to the expanding G. Heileman Brewing Company in 1969. After nearly three decades without a Blatz brewery operating in Milwaukee, in 1986 Heileman built a new computer-automated Val. Blatz Brewery on N. 10th Street, designed specifically for contract/craft brewing. After sales failed to meet expectations, Heileman closed the facility in 1989 and sold it to Miller in 1995 for their Leinenkugel’s division. The original brewing complex was repurposed and divided into private apartments and facilities for the Milwaukee School of Engineering in the late 1980s. The Blatz brand lives on in the portfolio of the Pabst Brewing Company. ^ Brenda Magee, Brewing in Milwaukee (Charleston, SC: Arcadia Publishing, 2014), 53; Stanley Baron, Brewed in America: A History of Beer and Ale in the United States (Boston: Little, Brown, 1962), 211. Variations of Valentin Blatz’s name in different sources include Valentine and Val. Blatz most often signed his name Valentin and used the shortened form Val. Other Brewery sources use the form Valentine. “Valentin Blatz Correspondence,” Sussex-Lisbon Area Historical Society, Inc., August 15, 2015. ^ One Hundred Years of Brewing (Chicago and New York: H.S. Rich & Co, 1903; repr., New York: Arno Press, 1974), 333; Thomas C. Cochran, The Pabst Brewing Company: The History of an American Business (New York: New York University Press, 1948), 54. ^ Perry R. Duis, The Saloon: Public Drinking in Chicago and Boston, 1880-1920 (Urbana and Chicago: University of Illinois Press, 1983), 18-19. ^ Industrial History of Milwaukee: The Commercial, Manufacturing, and Railway Metropolis of the North-West (Milwaukee: E.E. Barton, 1886), 103. ^ Industrial History of Milwaukee, 105; “Valentin Blatz Dead,” Obituary, Milwaukee Sentinel, May 27, 1894. ^ Industrial History of Milwaukee, 103-104; Cochran, Pabst, 64, 423-425; “Remember When…Blatz Beer Was First Brewed Here?,” Milwaukee Journal, April 17, 1979, 21. ^ Blatz also owned icehouses and coal sheds along the Milwaukee River; Industrial History of Milwaukee, 103-104; One Hundred Years of Brewing, 332. ^ Harry H. Anderson, “Recreation, Entertainment, and Open Space: Park Traditions in Milwaukee County,” in Trading Post to Metropolis: Milwaukee County’s First 150 Years, ed. Ralph M. Aderman (Milwaukee: Milwaukee County Historical Society, 1987), 261; “Valentin Blatz Dead,” Obituary, Milwaukee Sentinel, May 27, 1894. ^ A major depression in the late 1880s prompted British entrepreneurs to seek more lucrative foreign investments, like the burgeoning American brewing industry. One Hundred Years of Brewing, 333; “Chicago and Milwaukee Beer Trust,” Chicago Daily Tribune, February 17, 1891, 1; Amy Mittelman, Brewing Battles: A History of American Beer (New York: Algora Publishing, 2007), 65, 121. ^ Carl H. Miller, “Beer and Television: Perfectly Tuned In,” BeerHistory.com, accessed March 9, 2014. ^ Mittelman, Brewing Battles, 153. ^ Ibid. ; Edward R. Johnson, “Call Merger Anti-Trust Act Violation,” Milwaukee Sentinel, October 2, 1959, sec. 1, 1-2. ^ “Black Enterprises, Two Others Submit Offers to Buy Blatz,” Milwaukee Journal, July 14, 1969, sec. 1, 1, 14; “Heileman Approved for Blatz Purchase,” Milwaukee Journal, August 7, 1969, sec. 2, 22. ^ Chuck Doherty, “Blatz Plant Bidder Acts as Beer Broker,” Milwaukee Sentinel, September 1, 1990, sec. 2, 6; Lee Bergquist, “Blatz Reopening Vindicates Decision to Build,” Milwaukee Sentinel, December 13, 1994, sec. D, 1; “MillerCoors Brewery Locations—MillerCoors,” accessed May 31, 2014, http://www.millercoors.com/Who-We-Are/Locations.aspx. ^ Fran Bauer, “Blatz Building May Be Rebuilt,” Milwaukee Journal, May 7, 1985, sec. 2, 1, 9; “Blatz Is Back,” Milwaukee Journal, October 19, 1987, sec. A, 6; “Pabst Brewing Company Beers,” accessed May 31, 2014. Appel, Susan K. “Building Milwaukee’s Breweries: Pre-Prohibition Brewery Architecture in the Cream City.” Wisconsin Magazine of History 78, no. 3 (Spring 1995): 163-199. Cochran, Thomas C. The Pabst Brewing Company: The History of an American Business. New York: New York University Press, 1948. Mittelman, Amy. Brewing Battles: A History of American Beer. New York: Algora, 2007.